The Price of Freedom is a true, grand-strategic treatment of the American Civil War. It is a fast playing card-driven game depicting the entire 4-year struggle. The game is designed to play to completion in about 3 hours, making it ideal for tournament play and for gamers with limited time. 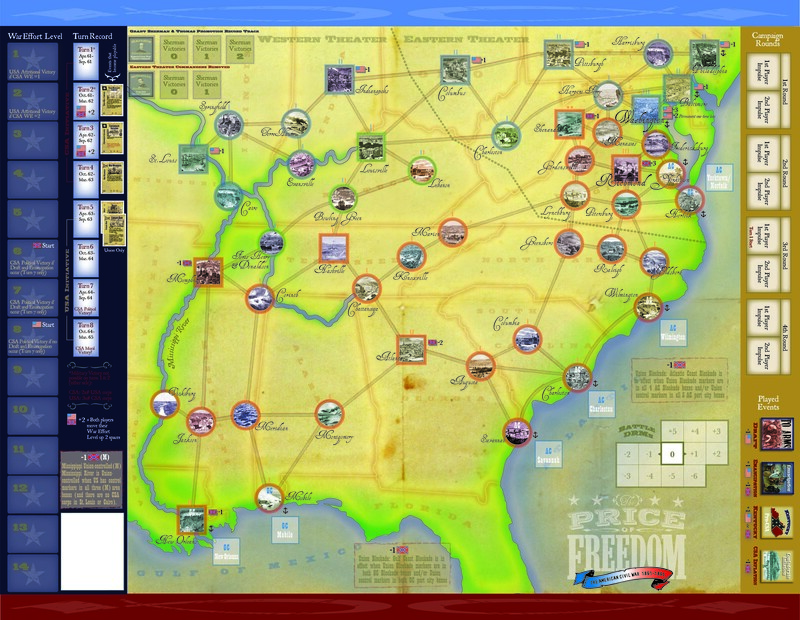 Designed by Renaud Verlaque, The Price of Freedom uses a variation of the popular card-driven system found in many other games. The difference is Renaud’s unique treatment providing strong historical flavor and high replay value. There are 25 historical army commanders represented, each with varying levels of ability affecting the maneuver and combat capabilities of the corps they command. The entire American Civil War plays out on a beautifully rendered map depicting the strategic scope of the campaign. Wonderfully illustrated corps counters feature the artwork of Don Troiani and portraits of the commanders give The Price of Freedom a distinct period look and feel.